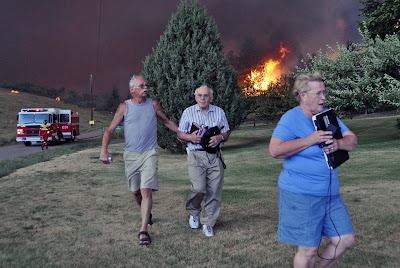 This is a picture that was taken of my Aunt & Uncle being evacuated from their home in West Kelowna on Saturday. Looking at it even now brings tears to my eyes. It was taken by John McDonald and I downloaded it from the Kelowna.com website. I just wanted to share an update with those of you who have been praying. My Aunt & Uncle are perfectly safe in a neighbouring community. Friends of theirs have given them a place to stay. Today my Uncle was able to see their home briefly and a miracle happened- their home is fine! Everything around them is completely incinerated and black. Their neighbours homes were destroyed. They are both so very sad about the devastation around them but thankful their home was saved. So thank-you God for sending your angels to protect my family! The fire is nowhere near contained- and there are actually 3 different fires burning out of control right now. You can see some pretty intense pictures of the fire on Kelowna.com. They are not able to return to their home yet and won't be able to for a few days probably but someone was able to get their car to them which is a huge blessing. Please continue to pray for the many many thousands of people who have been evacuated from their homes. Pray that the firefighters will be safe and able to contain the blaze. Pray for rain. And please pray for my Aunt & Uncle's dear friends and neighbours -the Gorman's- who are now homeless. Wow, just wow!!! Makes me want to weep seeing older people running in fear. I am glad they are safe and that there were angels protecting their home. That is so amazing! I just keep saying, "YAY God!" That is too cool! We'll keep praying! Praise God!!! So glad their home is OK. We serve a mighty GOD!